Update September 2018 - A musical toolset from June 2015 for the Apple IIgs by Antoine VIGNAU and Olivier ZARDINI. With code from Ninjaforce and FTA. Included is v2 that supports the 4soniq card with up to eight output channels. 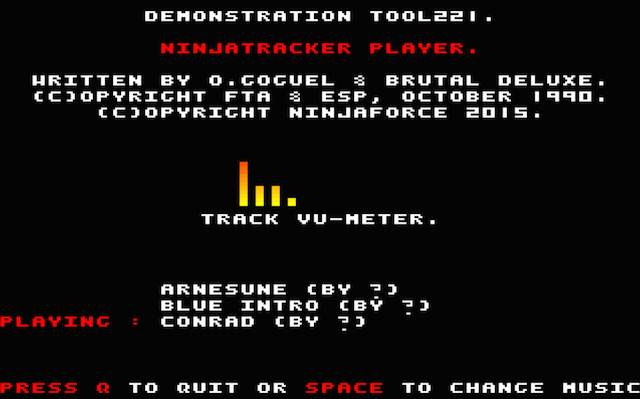 NinjaTracker Tool221 is a GS/OS toolset to play musical scores made with Ninjaforce's MODConvert2 software. It works like the Soundsmith toolset 219 written by the FTA. Tool221 integrates the NinjaTracker software that plays Soundsmith-like musical scores to which Amiga MOD effects were added. It supports all the effects of the Amiga MOD files. The disk image includes all the ncessary files for you to install, understand and use this new toolset. Based on FTA's Tool219 with the addition of Ninjaforce's NinjaTracker, get Tool221 and listen to high-quality musics. Error codes were wrongly returned when there were no errors! NinjaTracker Tool221 plays music files generated by Ninjaforce's MODConvert2 available at http://ninjaforce.com/. Big thanks to the FTA and Ninjaforce for their approval.